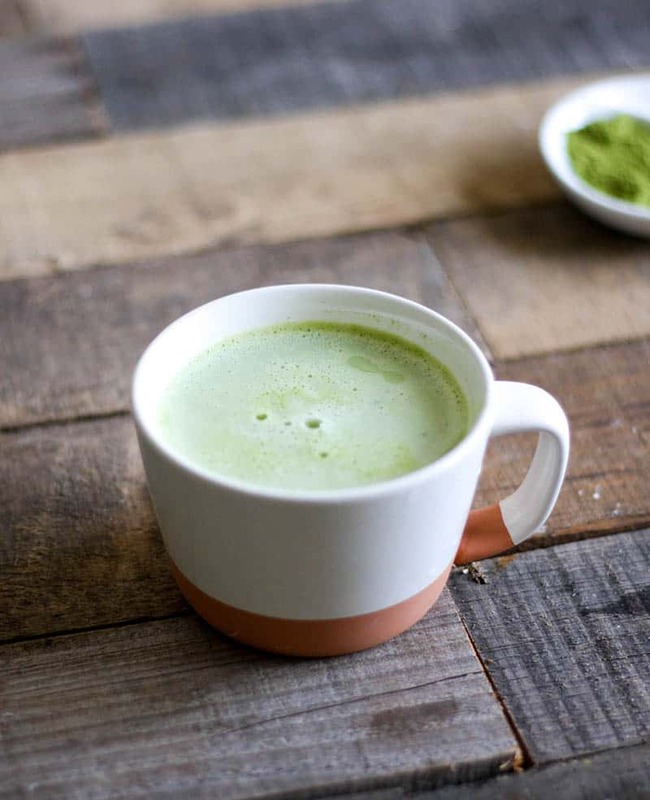 This AIP Coconut Matcha Tea Latte is the perfect coffee replacement for anyone following the Autoimmune Protocol or an Autoimmune Diet. Drink it in the morning to replace your morning coffee, or indulge in one as an afternoon pick me up. Good news for all of you following the autoimmune protocol, or simply looking for a way to reduce your caffeine intake: I have the perfect replacement for your morning cup of coffee. I introduce to you, the Perfect Coconut Matcha Latte. 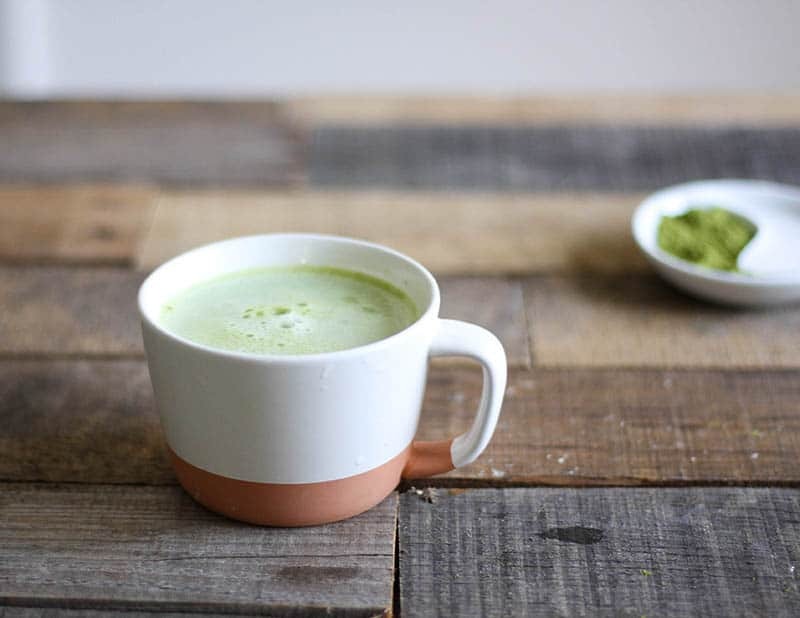 The perfect matcha latte has several distinguishable characteristics: perfectly frothy, not too “green” in taste, slightly sweet. It should also leave you completely satisfied (i.e. not craving your ole go to, Mr. Coffee). Now if you’re thinking I’ve just described the impossible – that there is no way you could ever not miss your morning coffee, well my friend, you’re simply mistaken. You see, I’m what you would call a coffee connoisseur, and definitely not your average coffee drinker. I’m extremely particular about the freshness, roast, grind, brew, and temp, not to mention the sourcing of my coffee beans. So you see, a mediocre cup just won’t do (sorry, Starbucks, but no…). Not only did I create an entire 7 day detox program focused around coffee (butter coffee to be exact), but I’ve been known to travel to three separate coffee shops in one morning in search of the perfect cup, since the first two I tried just didn’t do it for me. So, I hope you trust my judgement when I say that the perfect matcha latte has the power to not only make you question your monogamous relationship with coffee, but it may just become the new front runner in your love life. 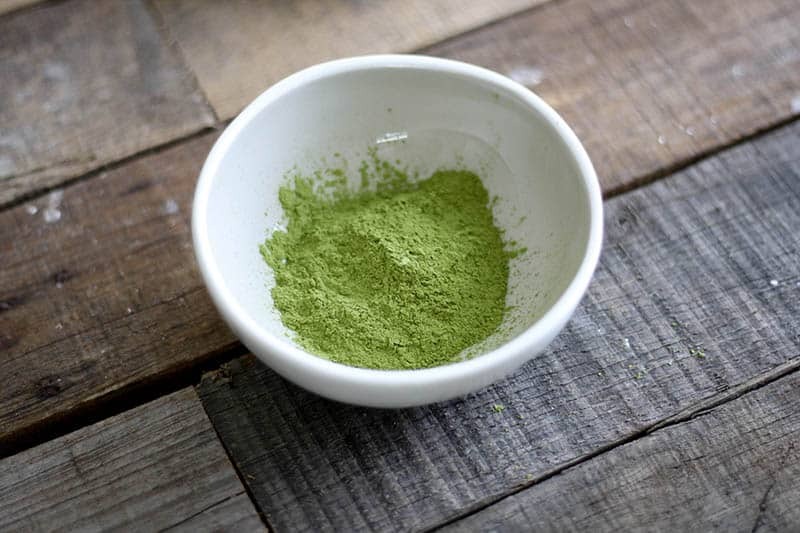 How is matcha tea different from loose leaf green tea? If you’re currently drinking a cup of green tea for the health benefits you’ve seen touted on the covers of the health and fitness magazines in the grocery store aisle, you’re missing out. When you drink green tea, you’re trusting the water to extract beneficial properties from the leaf in its whole form. The problem is, water can only extract a small portion of the beneficial antioxidants, minerals, vitamins, and amino acids from the leaves. Which means, you’re throwing away most of what you bought the green tea for in the first place. Matcha tea on the other hand, is stone ground tea leaves. These tea leaves are young and delicate, and most often are hand picked in Japan before being flash frozen to preserve their nutrients. Matcha tea is sensitive to light and heat (I told you, it’s delicate! ), so you’ll want to make sure you’re purchasing matcha that is stored in a tin container, or an opaque bag, and storing it in the fridge after opening. Since you’re consuming the whole leaf when you drink matcha, you’re reaping all the benefits. In fact, just 1 cup of brewed matcha tea is equivalent to 10 cups of brewed loose leaf green tea. How’s that for a superfood? Who’s ready for some matcha?! Heat your water over medium low heat. Be sure not to boil it! As I mentioned, matcha is delicate, so we don’t want to shock it with boiling water. Heat coconut milk in a separate pan. Add 1 tsp. matcha powder to a small bowl, and pour about 2 tablespoons of the hot water on top. Using a bamboo whisk or the back of a spoon, stir the matcha powder into a paste. 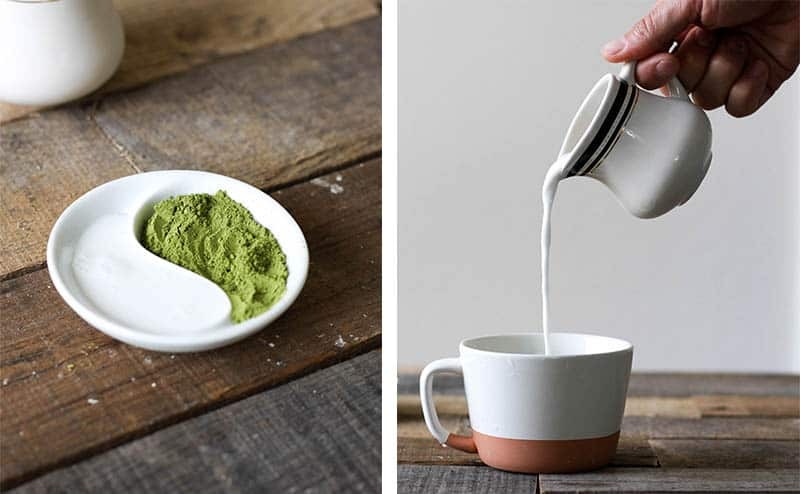 Combine the hot water and matcha powder in a mug. The matcha should combine pretty easily into the water. Use a hand-held frother or a high powdered blender to combine the collagen peptides, coconut milk, vanilla bean, and honey. Pour the mixture into the mug with the hot matcha and water. If you’re using a hand-held frother, you can use it on the top of the latte to add more foam to your latte. Be sure to use full fat coconut milk, as it provides your body with a healthy source of MCTs, not to mention, it produces a much creamier latte with more foam! This article by Autoimmune Wellness explains how vanilla powder can be included on the elimination phase of the autoimmune protocol. I’ve heard that vanilla beans are not approved on the AIP. Can you elaborate? Thanks! Excited to try this recipe! Wow, that link was super helpful! Thank you! When you say full fat coconut milk- is that the kind from the can vs the box/carton? If so, do you mix the solid cream in with the water, or just use the cream? Yes, the can is full fat, and the carton is usually diluted and adds fillers and gums. For this recipe I shake the can before I open it to combine the cream and water. Hi Anne! Do you recommend a hand held frother or blender? Water is actually an excellent solvent for extraction of the medicinal qualities of leaves, flowers, roots and berries. It allows a lot of surface area to reach the plant, and when the plant is grown and dried well there is much to extract. Powdered herbs work well too, as long as they are stored away from light and are used within the year they are bought, since that amount of surfacd area allows it to degrade more quickly. Will you please share where you buy your matcha? What vanilla powder is AIP? Having hard time finding one. Great question! I just updated this post to include the one I recommend, and in the notes of the recipe I shared a link as to why vanilla powder can be compliant on the AIP.